We live in a data-driven world, and the best way to be effective as a human is to make goals, set up a timeline and find a source of accountability to push you to hitting your deadlines and accomplishing your goals. As someone who tries to make the most out of every minute of a work day, I want to share how I use data for more than measuring my success in business. I use data to measure success in life. Managing the analytics and data of time is not the quick fix to get everything done. Time management covers the “work smarter” part, but I believe that when applying this idea to how you manage your time, you also have to add the component of “work harder” in order to push yourself to complete tasks in the most timely manner. One of my favorite tools for optimizing time management is setting up time blocks for everything and then optimizing those blocks of time for getting things done. Recently, I was in a one-on-one coaching with an account executive talking about time management, and we came up with a few efficiency blocks of time during the day set aside to accomplish two sets of daily tasks. The morning block was set up to accomplish the more tedious tasks (cleaning out emails, updating Salesforce.com records, setting up next steps for active opportunities). This time was schedule as the tactical block. There was another block set up in the afternoon for strategic work (researching companies, reading blogs and articles on pertinent industry info, networking on LinkedIn). Setting up blocks of time for tactics and strategy that have several tasks assigned to them allows for time to stay on top of all of your work and even get ahead over the course of the work day. Every day is different, and I map this time out either on a daily or sometimes monthly basis depending on the projects that I have outstanding. None of the scheduling parameters are hard stops. Sometimes the morning session is completed early, so there is time to schedule more calls or attend webinars. It is also helpful to schedule out different blocks of time focused on specific projects or relationship/team building time. I am a morning person. I wake up and am ready to face the day. A lot of people I know are not morning people and would not enjoy my schedule. I like to get up and to the gym to get my day started. That way I have one of my major daily tasks out of the way first. You have to understand your needs when it comes to eating, sleeping and being active and how that impacts the work you are able to get done at different times of the day. Optimizing the time of day to achieve maximum results is key to sticking with your time management plan. Certain times of the day are the best to work on creative projects, and other times are ideal for buckling down and knocking out the more tedious projects (like writing out operations processes). The best way to optimize your time is to associate the tasks you want to complete with the energy ups and downs you tend to have during the day. Life should be geared toward accomplishment. Goals should be set for every area of your life: personal, professional, spiritual, physical, philanthropic, etc. Most people I know aim for the New Year’s resolution approach to goal setting where they have a few ideas for the new year and that’s about it. After my initial round of goal setting, I follow up with setting a time frame for accomplishing the overall goal and then break it down into smaller goals to measure my progress. If my goal is to grow my commissionable revenue by 25%, then I have to figure out how to optimize my time and my processes to make that an achievable goal. Perhaps I need to spend one additional hour of the day prospecting, attend a weekly networking event and schedule time to become more of an expert and thought leader in my chosen field. The results from making those changes can be measured and then iterated upon until the desired outcome is reached. The last piece of effective time management is finding a tool to keep you accountable. It can be as easy as keeping a list of goals in your work space in your line of sight. It is a big first step to set goals, but giving them visibility adds a level of accountability that ties your reputation and success to your ability to manage your time effectively. Here comes the data piece! 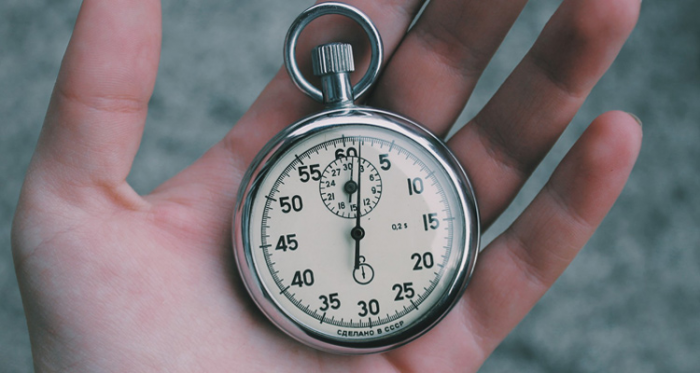 How can you be assured that you are managing your time in the most effective way? You have to measure your success. Are you able to maintain the schedule? What have been your biggest obstacles? Are you biting off more than you can chew? Are you being specific enough with what you want to achieve? Once you have a system that seems to work, you have to understand why it works. Track the results and make the necessary shifts to optimize your time. If you find yourself under too much pressure, amp up the down time and open up the schedule a little more. Maybe you want to focus down on details like time to make calls or send emails, or maybe you just want to open up blocks to focus on generalities – prospect, research, close. The more detailed the goals and the more specific the purpose of the time blocks, the more you get done. Success in this way is empirical because you can track your progress toward completing a goal and learn the best way to understand the optimal cadence. As you iterate on the time management piece, you can become more and more efficient at using those blocks of time. I get my time back frequently because instead of taking all of a time block to accomplish a goal, I do my best to knock out the task and give myself time back on my schedule. That time ends up being great for reflection on my current schedule or adding activities and adventures to my schedule. I tend to get back all of my extra hours in the day by being ahead of the schedule I set for myself.